I can only associate 2012 with the London Olympics and that disaster scenario movie 2012, however some people are gazing into the future with clearer eyes than me… and can see what mobile apps we’ll be using in that far distant year. Gartner are an internet research company and they have worked out, based on current trends what apps will be popular in two years time. 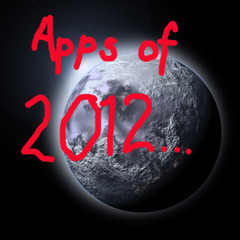 These are the 10 types of app we’ll be downloading and using in 2012 probably while sipping silicon lattes and wearing goo suits. Or something. This service allows people to send money to others using Short Message Service (SMS). Lower costs, faster speed and convenience compared with traditional transfer services, appeals to developing markets. Location-based services (LBS) form part of context-aware services, a service that Gartner expects will be one of the most disruptive in the next few years. Gartner predicts that the LBS user base will grow globally from 96 million in 2009 to more than 526 million in 2012. The industry needs to improve the user experience of mobile search so that people will come back to the same engines. Consumers will stay loyal to some search services, but instead of sticking to one or two search providers on the internet, Gartner expects loyalty on the mobile phone to be shared between a few search providers that have unique technologies for mobile search. Mobile browsing is a widely available technology present on more than 60 per cent of handsets shipped in 2009, a percentage Gartner expects to rise to approximately 80 per cent in 2013. Gartner has ranked mobile browsing No. 4 because of its broad appeal to all businesses. Mobile health monitoring is the use of IT and mobile telecommunications to monitor patients remotely, and could help governments, care delivery organisations (CDOs) and healthcare payers reduce costs related to chronic diseases and improve the quality of life of their patients. These are Doctor on your phone apps. Mobile payment made Gartner’s top ten list because of the number of parties it affects — including mobile carriers, banks, merchants, device vendors, regulators and consumers — and the rising interest from both developing and developed markets. Because of the many choices of technologies and business models, as well as regulatory requirements and local conditions, mobile payment will be a highly fragmented market. Mobile advertising in all regions is continuing to grow through the economic downturn, driven by interest from advertisers in this new opportunity and by the increased use of smartphones and the wireless Internet. Total spending on mobile advertising in 2008 was $530.2 million, which Gartner expects to will grow to $7.5 billion in 2012. Cost and the inability to type fast enough have historically held back adoption of mobile instant messaging (IM), while uncertain business models have precluded widespread carrier deployment and promotion. Mobile IM is on Gartner’s top ten list because of latent user demand and market conditions that are conducive to its future adoption. It has a particular appeal to users in developing markets that may rely on mobile phones as their only connectivity device. Mobile music so far has been disappointing — except for ring tones and ring-back tones, which have turned into a multibillion-dollar service. On the other hand, it is unfair to dismiss the value of mobile music, as consumers want music on their phones and to carry it around. We see efforts by various players in coming up with innovative models, such as device or service bundles, to address pricing and usability issues. iTunes makes people pay for music, which shows that a superior user experience does make a difference. Related: The Rick Astley iPhone worm – can he ever escape?